The churchill is a very nice rta. The build quality top notch and just feels like they take their time building each one. I got the black one and the color is beautiful. I have built everything from dual to single coils. The build i like running on this rta is a dual 26/36 aliens or for a single 4 core 28/36 aliens. Spend the money and put a nice build in this rta and you will love it. When I was trying to pull out the drip tip, ULTEM was broken....... Where can I buy the ultem tank? I decided to make my first foray into the higher end rta world with this atomizer. I am not thrilled with it. I have ran 3 builds on it so far two dual coil and one single. I have also tried four different types of cotton and 3 wicking styles each. When it wicks the flavor is passable, but I find that it's either flooding or I may get one or two good puffs on it before it's dry. On a good hit the flavor is not any better than my $25 engine rta. The build quality is phenominal, but in my couple of weeks I have spent with it I would recommend a handful of rta's before this one. I bought the SS version at a local shop when nobody online had it in stock except for places in Canada. I get great flavor off this rta usin dual 3mm id fused claptons. To me this rta offers better flavor than the Reload rta, Sherman rta, and even the Ohmec. It is a pretty easy and straight forward tank to build. On my first build I did have some leaking issue and I relate that more to that this tank does not seem to like wicking Kendo Gold cotton. I regrouped and used some v2 Cotton Bacon and have yet to have an issue. At the time of this write up I have had the tank for about a month and use it daily. Some might be concerned with the Ultem threading but they are very smooth and so far it is a non issue, but it is something I try to be careful with just in case. I found the stock drip tip to fit a little loose, but there should be a thicker o-ring in the accessories bag to remedy this issue, and the issue was also addressed in the black version prior to release. Personally I like to use one of the Sherman v3 drip tips. If you are looking for a great flavor rta then imo the Churchill delivers. I got this when I was up at CVE Toronto 2017. Best rta I've used yet. Build and wicking was easy, refill is a breeze. You Do Not have to close off airflow to refill like most other rebuildables. Great flavor. I will be getting another one soon. 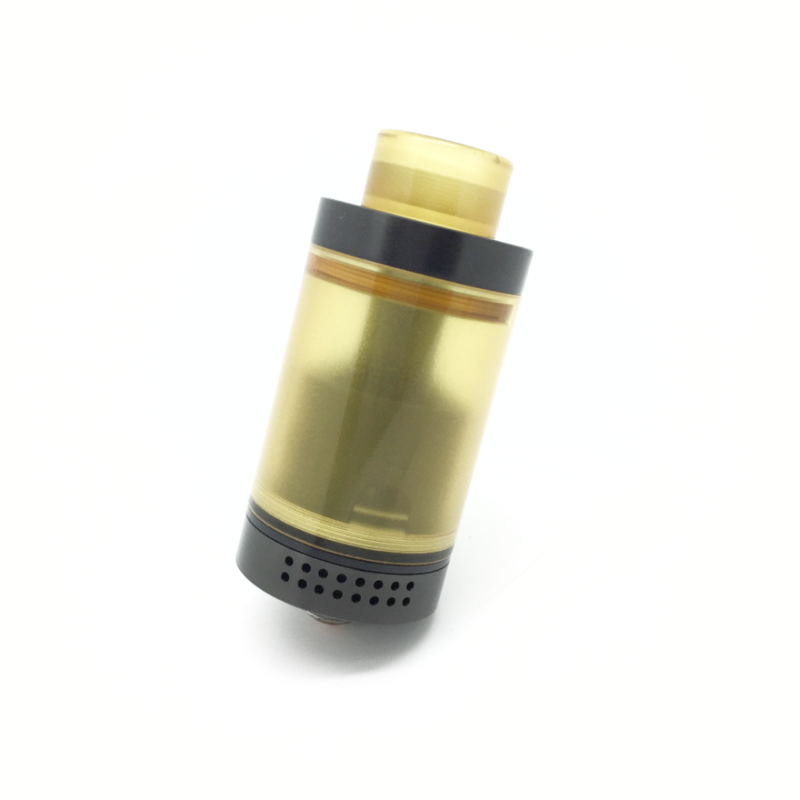 Just found this site and since not too many people have the Churchill, yet, I thought I'd drop my review: This rta is a bit finicky in that it really performs according to your coil build (not as forgiving like the Reload). I had major leaking issues because I was trying to keep my wicking too light and fluffy like I do with drippers. It's really just a simple thick 'bow tie' cut and you drop the barrel down over it and it's placed perfectly with a few tucks of stray stands making sure the juice ports are fully covered. I haven't tried single coil yet as dual has been working great for me. I find I get a slightly more dense saturated flavor better than even the Reload (which I love, btw) with the same build and no dry hits or flooding. Wasn't sure about the threading of ultem to ss but I've been playing with it a lot and have had no issues. It's machined extremely well. It's become my daily rta. Oh, the chimney does come out - it's reverse threaded. I didn't really know what to expect going into this tank but figured I would give it a try. The flavor I get from this RTA is better than anything I have ever used. Super easy to build and wick as well. Highly recommended!! Hi, better than the Reload RTA? Got it today and just built it. Flavor is the best of any tank I have. I use RTA 80% of the time and this wicking is great. No problem the first time wicking. Not sure about the ultem tank but time will tell how long it lasts and it only comes with the one tank. Not sure if the top chimney is removable but I couldn't get it off. All in all it's a great tank.